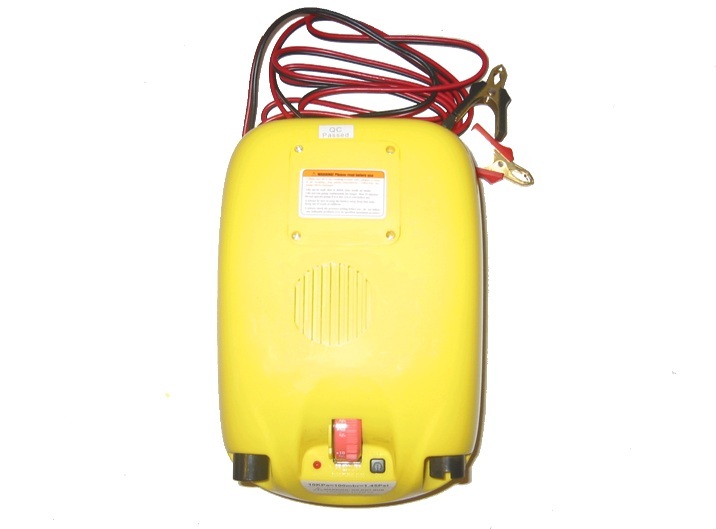 OUR HIGH-PRESSURE AIR PUMPS are incredible dual action, automatic, 12 volt pump developed in Australia. Designed to blowup inflatable boats with no effort at all. Just set the pressure gauge and press the ON Button. The pump will then inflate your boat to its correct pressure and stop automatically. Pump can be adjusted from 2.2 PSI up to a maximum of 12 PSI. By delivering around 200 liters/minute, an electric pump will inflate a typical 14' boat in about 8-10 minutes (compare to 15-20 minutes with a hand pump). High-pressure inflator pump automatically stops at the pressure level that you select and is also ideal for deflating. It comes with crocodile clips to connect to a 12V battery as well as a set of generic multi valve adapters. These pumps are not only excellent for quickly inflating boats and rafts, but also great for quickly filling inflatable high-pressure air deck floors and stand up paddleboards to up to 10-12psi air pressure. Pumps are adjustable from 2.2 PSI up to a maximum of 12 PSI. By delivering around 200 liters/minute, an electric pump will inflate a typical 14' boat in about 8-10 minutes. High-pressure inflator pump automatically stops at the pressure level that you select and is also ideal for deflating. It comes with crocodile clips to connect to a 12V battery as well as a set of generic multi valve adapters. When the pump starts, it will be on a HIGH VOLUME (Turbine) pump until the pressure reaches 2-3 PSI. Then the pump will automatically switch over to the HIGH PRESSURE (Piston) pump and inflate the boat to its set pressure. Once reaching the set pressure the pump will automatically turn itself off. 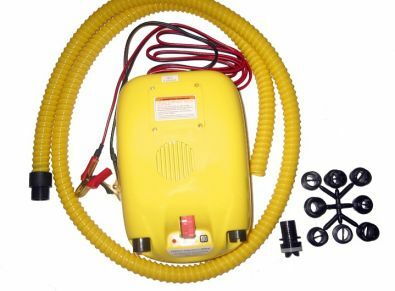 High-pressure inflator pump automatically stops at the pressure level that you select and is also ideal for deflating. It comes with crocodile clips to connect to a 12V battery as well as a 8-pcs multi valve adapters. Using any other adaptors beside provided can burn pump pistons and will void its warranty. Warranty: 3 months from date of purchase. Battery is NOT included with this electric pump. Our high-pressure pump can be used with a car battery, or with portable 12V 7AH batteries. 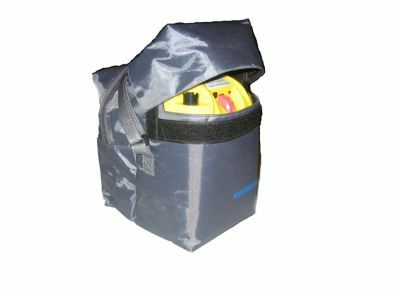 Optional 12V 7AH battery fits perfectly into pump's carry bag zippered pouch. What makes this pump better than models with built-in-batteries, is that you don't have to carry whole heavy and bulky pump back to wall charger. You can now carry only small and portable 12 7AH battery. Please read important WARNINGS below! Out of the several included valve adaptors, you will need to find one that fits tightly inside your air valve. The correct adaptor should have a small perpendicular plastic piece that goes inside across the tube or will have 2 small tabs. This perpendicular piece or tabs are designed to press on the pushpin inside the valve to open valve and allow air to be pumped inside boat chamber. Try different adaptors to see which one fit better and can firmly press on pushpin of your air valve. Before attaching the hose with the correct plastic valve adaptor to your Saturn boat Naru valve, please make sure that the pushpin inside the valve is in the upper, locked position. Air will not escape from a chamber when the pushpin is in the upper position. Insert the valve adaptor connected to the electric pump hose into the Naru valve, so that the perpendicular piece or tabs presses the valve pushpin down, and unlocks the valve by letting air in. Once the chamber is full to capacity, you will quickly pull one end of the electric pump hose, and the Naru valve will automatically lock itself. Never inflate air valve that is locked. This will burn pump very quickly and will void warranty. Set the proper air pressure in KPAs on your electric pump dial prior to operating the pump. Make sure that you do not over inflate the boat chambers. Please note, that high-pressure air floors withstand much more air pressure then boat tubes. 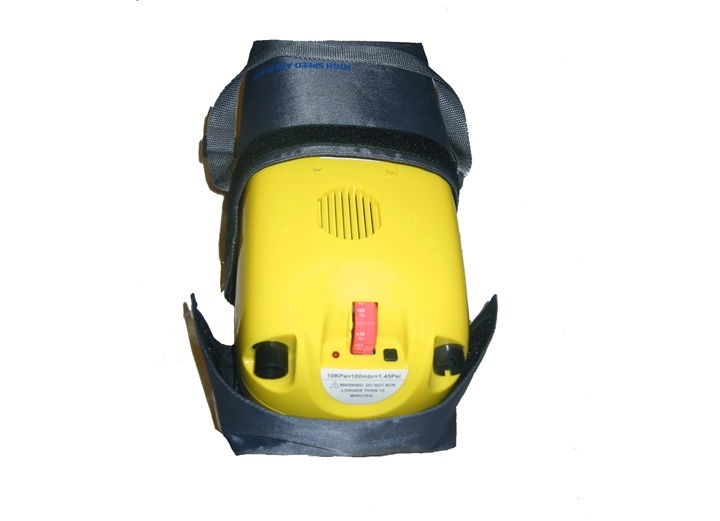 When the boat is deflated, the high-volume air pump will start quickly filling the chamber up to 80%, and then the high-pressure pump will kick in to fill the boat to the setting of the air pressure dial. You will hear more louder noise once high pressure piston pump will start working. That is normal. The pump should stop automatically once the correct air pressure is reached. My electric pump does not start when I connected cables to car battery. Why? If pump does not starts when connected to car battery with gator clips make sure that car battery are not too old and have enough power left in it. Try to connect to different car or another deep-cycle battery. Try to start car and let it run for couple minutes. I hear rumbling noises and small parts rocking inside the pump? Do not drop pump, there are plastic parts inside that can break. Do not overheat piston pump by trying to fill closed valves, running longer then 15 minutes or using small air output adaptors. Piston pump parts can break if overheated. If pump still within warranty period, send it back for replacement. Yellow hose connected to air output of pump become hot and let air escape. If pump running too long, piston mechanism get overheated and heat up hose too. Apply Teflon tape between hose and output or use metal clamp to secure it to the black output tube. Electric pump was stored in my car and now does not turn on. Why? Electric pump has temperature sensor built in and will not turn on if was stored in a hot car. Please allow deluxe pump to cool off in a shade or by holding it against car air conditioning vent for couple minutes. Pump switching to HP mode immediately after powering on. Why? Make sure that valve is locked, with pushpin in an upper position. Also, make sure you are using correct valve adaptor. Provided specialized valve adaptor should press on pushpin inside the valve and open it to let air in. As soon as you remove that adaptor, valve will automatically lock itself, preventing air from escaping. How to use specialized valve adaptor with Naru valves? "That's a great pump. Using it with my Sea Eagle 465ft kayak I can finally inflate it to manufacturer's recommended pressure and it does make a difference comparing to $80 HV turbine pump from Canadian Tire. I've replaced crocodile battery clamps with XT60 connector and now I use old cheap 2200mAh 3s battery instead of carrying heavy lead-acid brick or being tethered to my car. 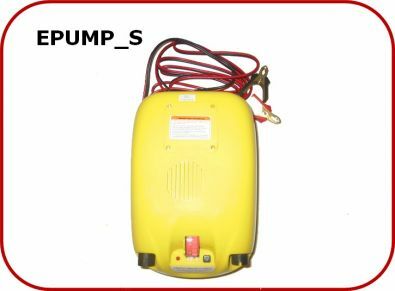 One very important feature of this pump is built-in air valve - even with pump off it does not bleed the pressure, unlike all turbine based pumps, which makes it safe if you need to top-up while being afloat." "I love it! I bought this pump for my SUP and it works great! " "Live safer, almost like set it and forget it ;-) eel not quite but this pump is great and with a $20- rechargeable battery will save your back keep your recreation days recreational! comes in handy carry-bag that fits the battery and cable plus your hose and fitting."